Old World glamour is mixed with classic French and European design. 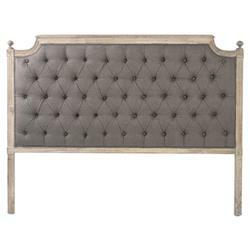 With elegant curves and button tufting, the Louis Headboard reflects the luxurious design and craftsmanship of the Louis XV period. An antique reproduction, it is hand finished in a limed grey oak and tufted with an aubergine brown fog linen.